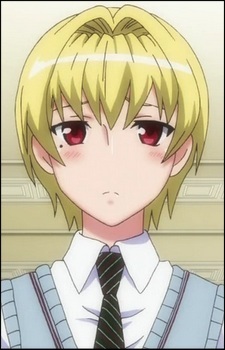 Shizu is Mariya's twin sister. She attends an all boys school which was also run by the ex-chairman. She has a similar hatred/fear of males, and had similar experiences as Kanako, who she affectionately calls 'Kana-chan'. Unlike Mariya, she appears to actually be the kind, innocent girl that Mariya attempts to portray. She is also quick to get her feelings hurt, as well. The agreement for the competition was the loser would be chosen if someone found out from either school; Kanako, thinking Shizu was Mariya, mentioned Mariya's touching her, which revealed to Shizu that Kanako knew Mariya's gender, thus defining Mariya as the loser. Shizu had only went into the school to switch with Mariya for their schools' physical examinations. However, because Kanako found out Mariya's secret before she began attending the school, it was null, and because Kanako knew Shizu's true gender, ordinarily, Mariya would've been claimed victor. But out of generosity, Mariya chose to overlook it in favor of his twin sister. The only way to distinguish between Shizu and Mariya is by the mole under their eyes; Mariya's is under his left eye, while Shizu's is under her right eye. Because of the switching with his brother her original name was Mariya instead. She is 160.6 cm tall, which makes her marginally taller than Mariya, and happens to be a sore point for him. The two siblings regularly compete, not just in height and weight, but in studies as well.